Celia “Celica Soldream“ Noguera Hernampérez was born in Madrid on November 5th in 1989. During her early childhood she showed an undeniable interest in music, growing up mainly listening to Mike Oldfield and The King Michael Jackson. She also liked music at school, so at the age of fifteen her family decided to sign her up in a music academy, starting playing transverse flute and taking solfeggio lessons. During her adolescence she also collaborated as a musician and singer with the high school choir, and took part in several musical and theatrical festivals. Although Celica has always liked many different music styles, over the years her tastes focused mainly on rock and metal music, at the same time as celtic, instrumental and soundtrack music, specially from movies and videogames (James Horner, Hans Zimmer, Jeremy Soule, Jesper Kyd). In this period Celica already believed in the strong connection between soul and music, and how the energy of feelings actually flows from one to another in a very special way that other arts just can’t do. Around the age of twenty, Celica joined the folk metal band Merhydiam, where she began to give live concerts and performances. Later he started his own project, Qualia. Although this band didn’t get too far, it assured her joining into the hard rock/metal band COTARD. 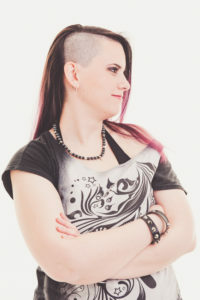 As the main vocalist of COTARD, Celica starred this band’s last albums (“Nunca Mas” and “Ojibwa”) and participated in 2015 Granitorock Festival, sharing the stage with the prestigious metal band Saratoga. Her stay at COTARD ended in the middle 2017 after several health problems. But her path didn’t stop there. Actually, she had the chance to redirect her professional career away from the stages and metal music, so she could focus on trailer and instrumental music industry. At the same time she started studying Psychology at university in Madrid, Celica began her journey through roleplay forums and games, where she made several fan trailers, using the epic music from Two Steps from Hell, Audiomachine or Brand X Music. She used these songs in order to create mashups and doing covers, singing her own vocal choirs and melodies over the original instrumental track. 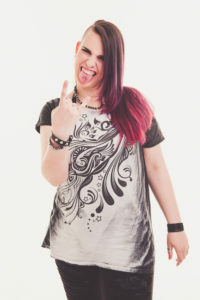 This encouraged her to participate in Two Steps from Hell Youtube Contest in 2013, becoming the only soloist singer among the final twenty winners, with two choral covers: Voices in the Blizzard and Black Armored. The following year, another cover on Youtube (The Power of Fire) became the piece that put her in contact with spanish composer and producer Ivan Torrent, with whom she made a demo for an 8dio sample library, Crystalline. Less than a month later, they made a second demo for the same company, Architects of Life. Her feature with Ivan was her trampoline into the world of epic and trailer music. Specially after working with Eduardo Tarilonte in 2014 recording her first sample library: “Heroica”. Initially, this library was only included on Era II: Medieval Legends Special Edition (Best Service). But later was added alongside “Celtia”, which Celica recorded in 2016 for Era II:Vocal Codex sample library. During her professional career in epic and instrumental music, Celica has had the opportunity to work with such famous composers as Ivan Torrent, Neal Acree, Dirk Ehlert or James Minas; and for trailer houses like dos brains and Really Slow Motion. She has shared albums with prestigious singers such as Julie Elven, Úyanga Bold, Einar Selvik or Merethe Soltvedt. Her greatest success came in 2016, with her collaboration with James Minas and Lydia Davies on the track Reborn (Really Slow Motion), chosen as soundtrack on Disney‘s Beauty and the Beast first official trailer. Her voice has also starred in REND and Star Citizen videogames trailers. In 2018 she sang for the intro of the animated short Warbringers: Azshara for World of Warcraft (Blizzard Entertainment). Celica has never stopped improving her musical training, and today she keeps receiveing singing lessons Albert’s Voices Professional Singing School, where she was teached by such prestigious singers as Beatriz Albert (Ebony Ark), among others. Celica has also taken several online courses about music and composition, and passed with “Merit” her 3rd grade Rockschool exams. Currently, she combines her work as a freelance singer with her classes as a teacher in the same academy she is studying at. We could say that Celica proudly considers herself a geek. She is very fond of literature and role-playing games, videogames, movies, writing, astronomy and anime/manga drawing. 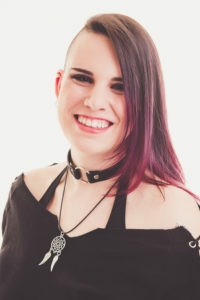 She rathers epic fantasy, urban fantasy or sci-fi themes, and is also a lover of Devil May Cry, Assassin’s Creed, Neon Genesis Evangelion and Harry Potter series. Celica is also interested in parapsychology, meditation, esotericism and paganism, reiki, gemotherapy and other spiritual healing techniques through energy. However, her passion for music stands out over anything else.